Since 2002, KeyBridge Technologies has been providing innovative business solutions to assist organizations in optimizing assets, knowledge, and service. We are a dynamic company with corporate experience, a dedicated staff, and a proven track record for ensuring customer satisfaction. KeyBridge’s success lies in the character of our organization and the people who make up our corporate team, our customers, and our partners. KeyBridge is a task/product-oriented organization. 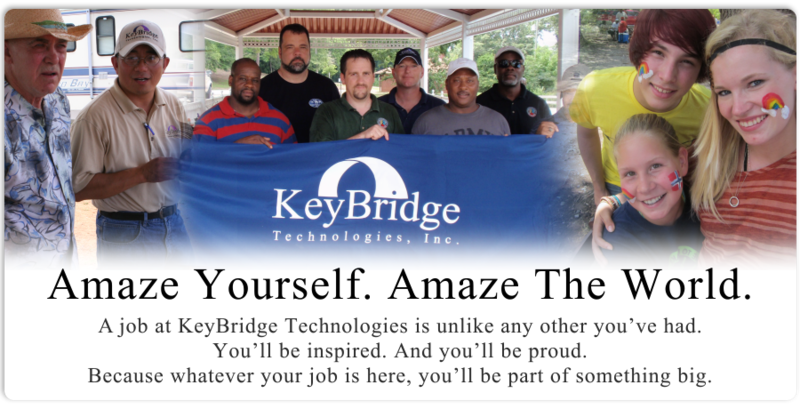 Our success lies in the character of KeyBridge's organization and the people who make up the company. KeyBridge is composed of highly qualified professionals, and is justifiably proud of the qualifications of the dedicated members of our staff. For each project we work on, we form a "task team" composed of individuals whose backgrounds, experiences, and qualifications match the needs of the project to be completed. We are constantly evolving by expanding our technical capabilities to support our existing clients and meet new challenges. As technology and the market change, our company focus remains the same. We are focused on our customers and how we can best enable their success. Technology is merely a means to that end.